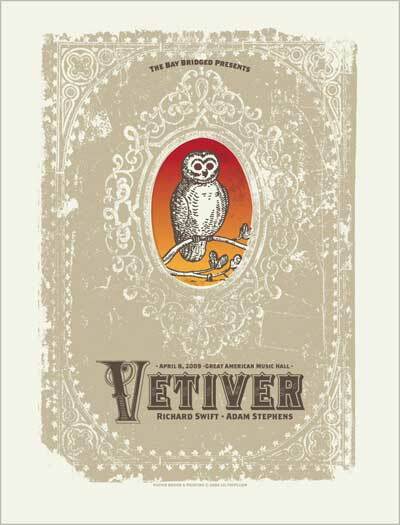 The Bay Bridged Presents: Vetiver’s CD Release Party Tonight! By The Bay Bridged|April 8, 2009|Comments Off on The Bay Bridged Presents: Vetiver’s CD Release Party Tonight! Amidst seemingly nonstop US and European touring, Vetiver returns to San Francisco in early April for a very special homecoming performance. It was a treat to see the band at the Bay Area Takeover at SXSW and we're very happy to present the official CD release party for their latest album, Tight Knit, out now on Sub Pop Records. As many critics have noted, the new album is an incredibly moving work, full of memorable layered songs that sound great live. Advance tickets are highly recommended for this one! Richard Swift - "Lady Luck"
Still Flyin' - "The Hott Chord Is Struck"